When building an iOS mobile application, one of the main issues of mobile developers is to know how to persist data on the mobile application so the user can save its changes. The need for a database is essential and Core Data is a great alternative for them. So what is Core Data? Core data uses a sqlite database to store all the information. This may be helpful so you can export that database for other uses, but right now we'll focus on understanding how a Core Data Application works. At the next screen, name your Product "MyContactDirectory", your custom company name and use MCD as the class prefix. Select iPhone as your device family. Click next and create the project. Now that you're inside of your project the first thing we're going to do is set a basic interface so we can create our directory. Take a look at the sidebar that is at the left of your screen and click on the file that is named "Main. storyboard". Now that we have drawn our interface, we need to connect some elements in order to have everything linked to our controllers. Our first step is to connect our table to our view controller. Press and hold your Ctrl key on you mac and click on the table view you just dragged to the view and hold and drag then click on the yellow icon at the bottom of the view. You'll see these options displayed in Figure 1.0 once you finished. Click on data source and repeat the process to click on delegate. Click on the table view and go to the attribute inspector. Set the table view cell identifier as "personCell". 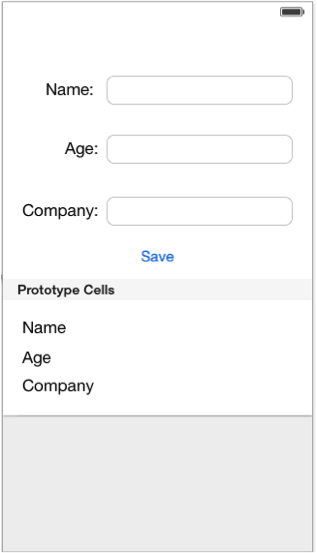 Our next step is to set an identifier for the labels inside the table view cell. 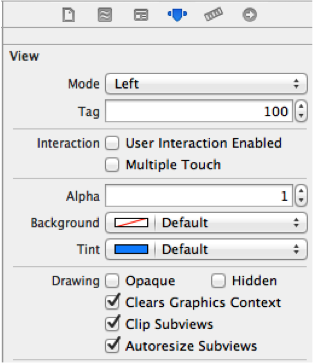 Click on the first label and go to the attribute inspector (Shown in the right side of xcode, icon in Figure 1.1 should be selected). Scroll to the different options and search for the Tag textfield in the View section and change the value to 100, repeat the step with the remaining labels inside the cell using the values 101 and 102 in the Tag text field. Our next step is to connect the elements to the MCDViewController.h file. Go to the top part of your application and select the assistant editor button (if you feel more comfortable hide the right side bar deselecting the button so the bar looks in this way. Once you see these two screens select the MCDViewController.h file from the top bar shown in the right side. You'll repeat the same process of holding ctrl key and dragging the views but this time inside the .h file. The first element we will connect is the table view. Hold Ctrl, click and drag the blue arrow to the.h file just between the @interface and @end tags. A dialogue will display asking you the name of the element you're adding. Name your table, "tableView" and click ok. Repeat the same process with the textfields and the button. 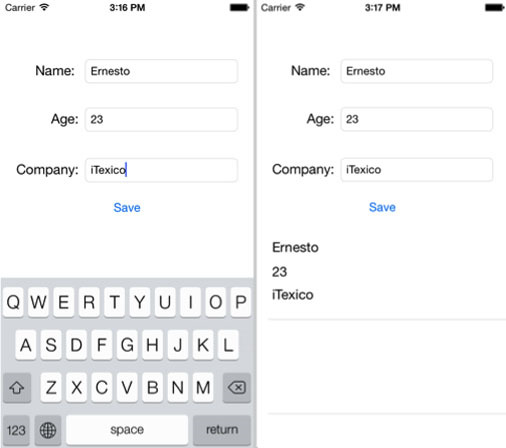 Name the first text field "nameTextField", the second one "ageTextField" and the third one "companyTextField". For the button use the name "saveButton". 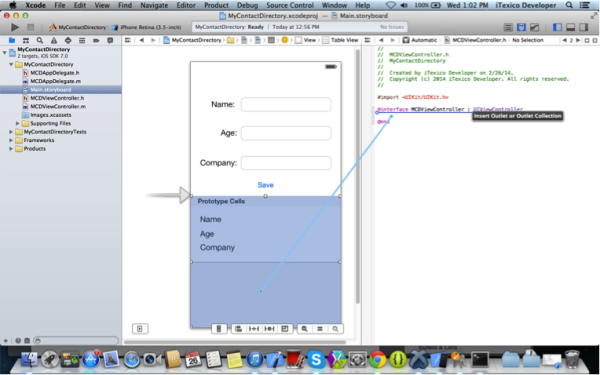 Call the delegates for UITableViewController in your interface. Now that we have the basic user interface we can create our data model. Go to your project window and click on Build Phases and next go to Link Binary with Libraries option. 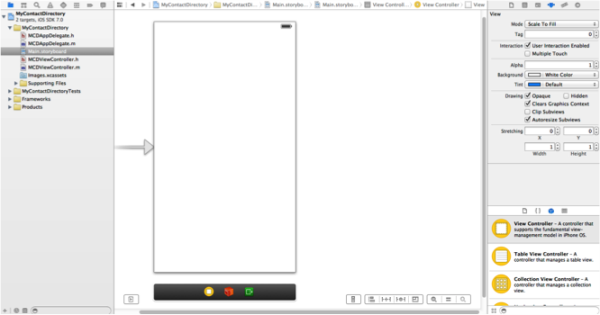 Click on the add button and add the CoreData.framework to the project. To start creating our model we need to create a new object model. To do this click file>new>File... (cmd+N) and select Core data/ Data Model and save it as a Model. Back on your project you'll see that a Model.xcdatamodeld was created. Click on it. Select your entity and click on file>new>file. (cmd + N) and select NSManagedObject subclass on the Core data section, click next. Our model should be selected, click next and the Person Entity should be selected as well. Finally, click finish. This should create you a .h and a .m file in your project with the name of your Entity. This class will be the model class of our application. · NSManagedObjectModel: This object describes the collection of entities that you use in your application. · NSManagedObjectContext: represents the object space and its responsibility is to manage a collection of managed objects. · NSPersistentStoreCoordinator: associates persistent stores with a model and serve to mediate between the persistent store and the context. · getUserData array: This is where the data in our model will be stored. 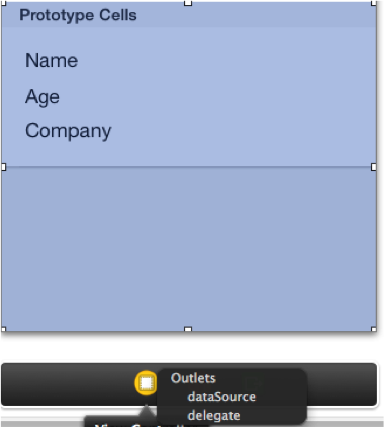 NSEntityDescription *entity = [NSEntityDescription entityForName:@"Person"
This method will let us save the context of our model to the application in a sqlite database and to define the entities so we can save the objects in the application. 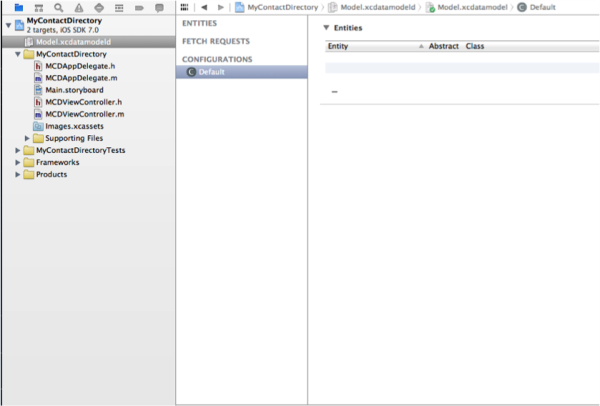 Moving forward to the actual data saving with core data lets us get to our MCDViewController.h file. Import the core data framework at the top (#import <CoreData/CoreData.h>) and import the Person class (#import "User.h"). Add the following code to your app. All the data that will be generated by the core data model will be stored in the App Delegate, that's why we need to make an instance of this class. We also declare a managed object context and an array that will have the fetched results from the core data model. Now that we have finished with the code we can run our application in the simulator. Let's Run it in the simulator or in our device. You should see an initial screen with no table rows (left image). We can add new info and when we press save our new person will be displayed on the table below (right image). We can keep adding new record to our database and they will be kept on a sqlite database. Working with core data can save you a lot of time and CPU usage. One good example where this can be used is when using web services. Instead of calling every time for information you can store those values in a data model and when there's new information you can refresh it. Ernesto Kuri is a Technology and Communication Engineer. He has been working on iOS mobile app development for 2+ years.